A bland diet consists of foods that are low in fiber and fat. Foods that are both low in fiber and fat are easier for your body to digest and are often referred to as low-residue or soft diets. Bland diets can be helpful during some medical conditions, as the foods are relatively non-irritating to the tissue in your mouth, throat, stomach, and intestines. Bland diets are not a dieting method for weight loss. When Is a Bland Diet Useful? Bacterial food poisoning: If possible, eat a bland diet and slowly return your diet to normal over one to two days as tolerated. Traveler's diarrhea: Bland diets may provide some comfort and nutrition while the common symptoms of an upset stomach may decrease your desire to eat. Nausea and vomiting of pregnancy (NVP), also known as hyperemesis gravidarum or morning sickness: Eating a bland diet in more frequent and smaller meals may help to relieve feelings of belatedness and nausea. Intermediate eating step after gastric surgery: A soft or bland diet is often used to advance your diet following surgery before you resume a regular diet. Gastrointestinal bowel disease: A bland diet may be recommended to use during acute cases or flares of Crohn's, irritable bowel syndrome, inflammatory bowel disease, ulcerative colitis, or diverticulitis. Bland diets are somewhat controversial in relation to diarrhea. Often, it's recommended to maintain a regular diet to ensure proper nutrition. However, due to the upset stomach and nausea that sometimes accompany diarrhea, a bland diet may be better tolerated. A BRAT diet is a diet that solely consists of bananas, rice, applesauce, and toast. While the BRAT diet is also considered a bland diet, it is more restrictive than the general bland diet. The intent behind the BRAT diet is to limit foods that are considered "binding," or provide bulking to your stool that make it more firm. Bananas, which are high in potassium, are particularly helpful, as diarrhea will tend to cause you to lose potassium. While this may be a potentially useful diet for adults, the American Academy of Pediatrics does not recommend this diet for children. You may, however, discuss this option with your doctor if your child cannot keep other foods down. Otherwise, children are encouraged to maintain a normal diet. The BRAT diet should not be used long-term, as it is not sufficiently adequate in dietary requirements, and malnutrition will occur. As you can see, there are many different types of foods that you can eat while maintaining a bland diet. As you can see from the lists above, a bland diet offers more variety than you may have originally assumed. However, there are some limitations that may restrict you from eating some foods that you might usually enjoy. While you can eat chicken while on a bland diet, you may find that you miss being able to add pepper to your meal. Instead, try using dried thyme on your chicken. Nutmeg is a spice often included in many desserts. 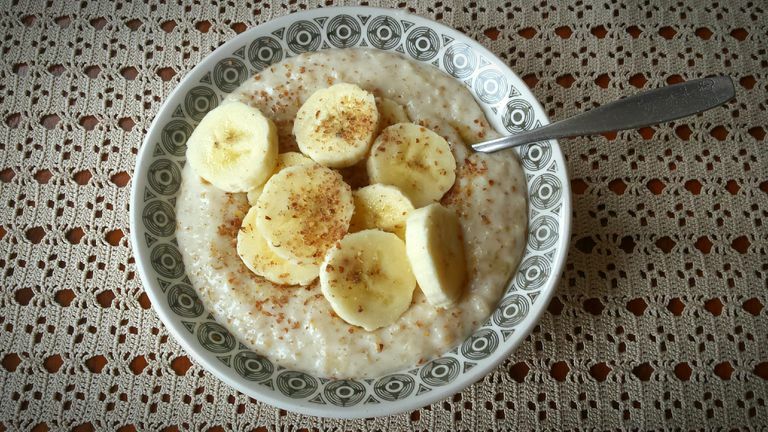 Try replacing nutmeg with cinnamon as an alternative spice for a tasty treat. While you cannot duplicate the crunchy sensation of nuts in your recipes in a bland diet, you can often find a nut butter that you can use as a substitute to add flavor to your favorite dishes. While you should avoid raw fruits, applesauce or other pureed fruits are acceptable to provide a fruit-filled treat. If you are hooked on caffeine, you may find avoiding caffeinated beverages difficult. Try drinking herbal tea, coconut water, or sparkling water to curb your caffeine fix. While fried eggs, meats, potatoes, or breads are to be avoided, try baking, broiling, or mashing these foods to replace fried substances in your meals. BRAT Diet: Recovering From an Upset Stomach. Clinical Key website. https://www.clinicalkey.com (Subscription Required). Updated Aug. 22, 2017. Managing Your Bacterial Food Poisoning. Clinical Key website. https://www.clinicalkey.com (Subscription Required). Updated May 11, 2016. Bland Diet. Clinical Key website. https://www.clinicalkey.com (Subscription Required). Updated June 27, 2018. How Does the BRAT Diet Help When You Have an Upset Stomach? Is There a Special Diet for People With Cirrhosis?